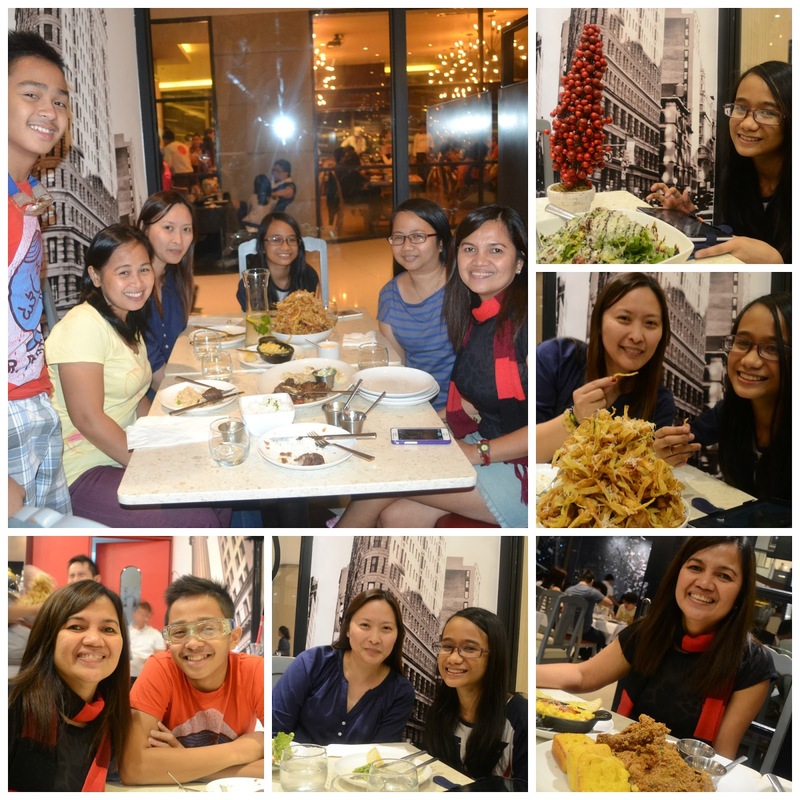 My Amgurls group happen to have a spur-of-the-moment dinner date last Saturday so I suggested Kettle at the East Wing of Shangri-La Plaza. Hubby, daughter and I passed by this resto several times last year but we always end up in another somewhere. This restaurant is barely six months old but people are already talking about it. It serves good old comfort food and that is the reason why people keep coming back, especially families or group of friends during weekends. They also have a no-reservation policy during weekends so it is advisable to go there early to secure a table. Daughter and I arrived ahead of our group but the tables inside are all occupied except the one near the door- yey! The menu was so exciting that I ordered as soon as we sat down. Will just order again when my friends arrive. Kettle House Salad, P339. Not really photogenic but its quite good. The lettuce was fresh and crunchy, and I love the balsamic dressing. It could use more bacon though (but that's just me). Good for 2-3pax. Smoked U.S. Beef Brisket Sandwich, P359. Daughter ordered this because she loves "beef". It comes with fries. Serving is good for sharing although daughter said that she can finish it herself. The beef was tender and I love the smokey flavor combined with the coleslaw. Truffle Gorgonzola Pasta, P289. The one on the menu says spaghetti but we requested for penne. Comfort food indeed. Good for sharing if you're not that hungry. I love the crunchy basil bits, a nice twist to fresh basil. Two thumbs up! Mac & Four Cheese, P269. I love the four cheese sauce but found it a bit dry. We've been eyeing the desserts but was already too full to order. Maybe next time. Gigie and her not-a-little-boy Zyrus arrived late so they didn't get to taste what we ordered. They had the Australian Lamb Adobo, P449. Lamb was tender according to them. It comes with tzatziki. Daughter wanted to try this next time as lamb dishes comes second to her favorite beef. Pork & Potato Strips, P339. We were really quite full by the time Gigie and Zyrus arrived but almost every table has this dish and since we're seated near the door, we lost count on how many potato strip towers passed us by. Ruby happily noted that the one they served us was thicker than the other potato towers. This is a very interesting appetizer, one that's guaranteed to keep the kids (and kids-at-heart) busy playing potato stack-o. That's us- happy with our unplanned get-together and being served good food. Cheers!